I am yet again drawn to the beach and the effects and patterns of sand and water. I have spent a lot of time looking at the effects of sunlight on shallow water as it runs across the sand. I am intrigued at the way that a ripple in the water acts like a lens, concentrating sunlight like a magnifying glass on to the surface of the underlying sand while also casting areas of darker shadow in constantly flickering patterns of light and dark. 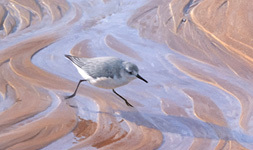 As the sea swirls over the sand at high tide it scours shallow bowls out of the sand, especially around rocks. As the tide recedes, the pools of water that collect here carve their own paths back to the sea in rivulets that twist and turn, cutting channels through the soft sand. 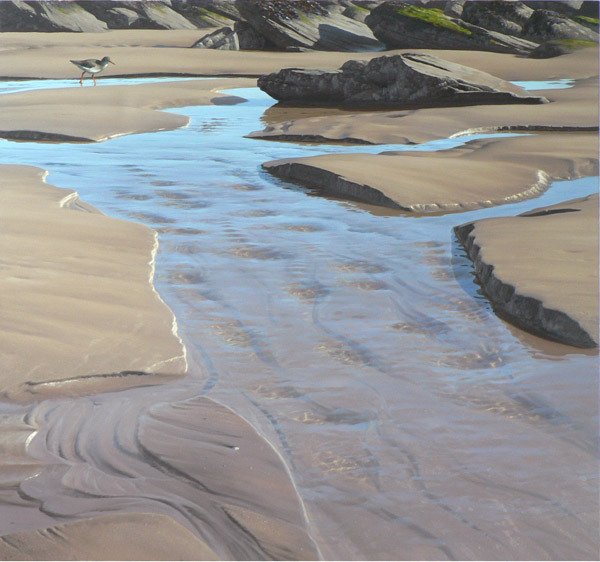 The seemingly abstract patterns of these beach-scapes are a source of fascination and intrigue to me. I liked the backdrop of solid, immovable rock at the top of the picture – a fixture in an otherwise constantly shifting landscape. 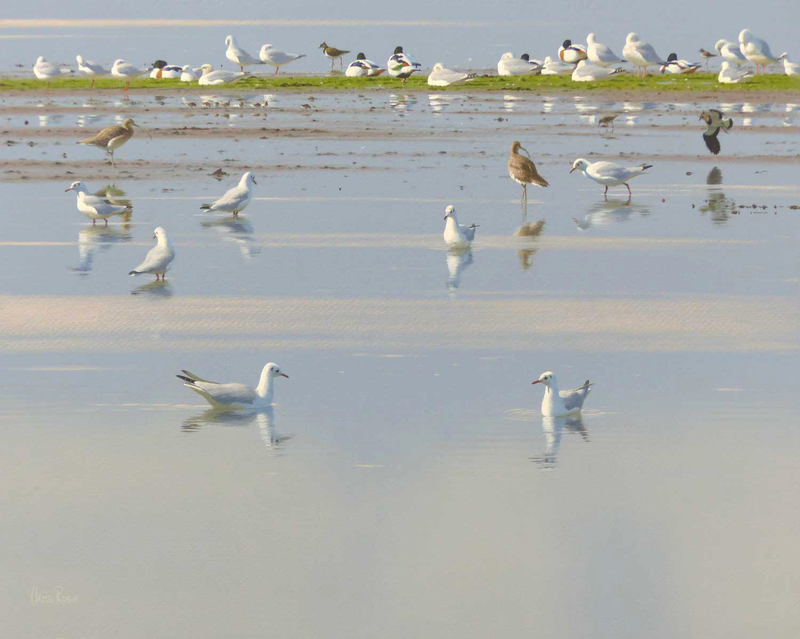 The redshank was originally going to be two curlews! Both species were present as I painted the field sketch but when it came to placing the curlews in the composition they dominated the picture. 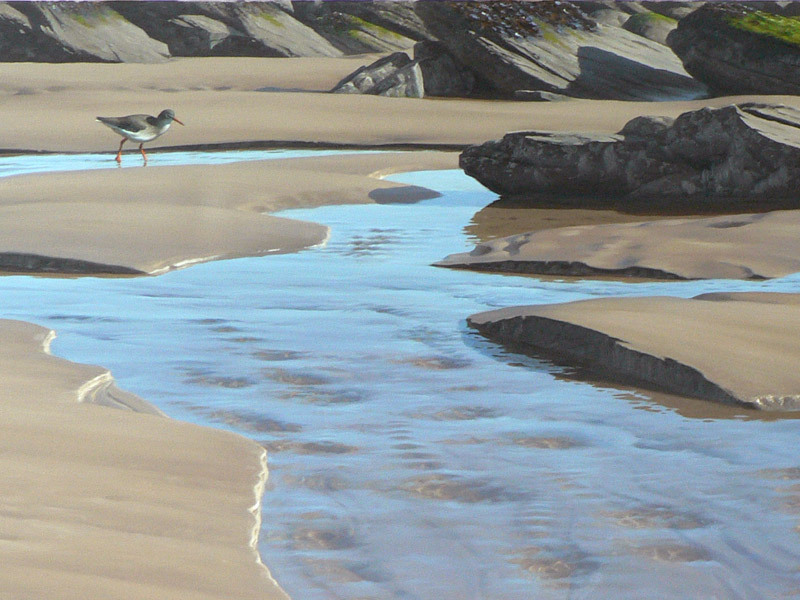 I replaced them with a single redshank, which seemed altogether happier in the environment of the painting. This painting is one of a pair depicting the same subject but in different light conditions. Its sister painting, Against the Light, shows broadly the same scene but looking in to the sun.